The decision has been made. The apartment has been rented, and now it’s time to make the move. While it may be easy for some, it can also be difficult for many to decide what to take with and what to give to family or donate. “I loved the thought of being closer to my church and meeting new friends,” says Joanne, resident at The Palms of Largo, a senior living campus in Largo, Florida. “My real concern was how I was going to get ready to move.” That’s where a program like My Home Connections can help. 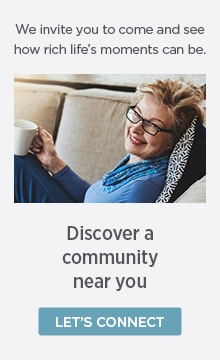 “The first thing I do is go to the new resident’s home and have a consultation,” says Deb, Marketing Support Specialist for the free service that helps seniors and their families downsize for a move into one of Florida communities managed by The Goodman Group. “I’m an advocate for the person making the transition from their home to one of our communities,” says Deb. She shared some of her secrets to help others who are downsizing. “I just walk around the house and let them talk and try to pick up on things they’re emotionally attached to,” says Deb. She usually focuses on the furniture — what will fit in the new apartment — but that’s not always the case. What if There’s Just Too Much? Sometimes it’s difficult to let go of objects that have an emotional component to them, like the woman Deb worked with who had several larger recliners she felt she needed. “I just show them options,” Deb says. That might include looking at a different floor plan or a larger apartment. Having options, and seeing those options on paper, can help seniors make the necessary decisions. Not all areas have My Home Connections or a similar service. However, family members can use Deb’s techniques to help their loved one make downsizing less stressful. Start by just taking a leisurely inventory of furniture and the most important possessions. Let your loved one tell the stories behind those prized possessions — it can be a gift to them and to you. “It is one of the reasons I love what I do, because I hear such wonderful stories,” Deb said. Draw out a floor plan together to help visualize where everything will go. If at first it seems like space is going to be an issue, take Deb’s advice and offer options, like considering a larger apartment or different layout. Most importantly, don't rush the process. Let your loved one take the time needed to adjust to the change.